Properly matching filtration equipment for a pond can be a challenge if you are like most and are a little short in knowledge of water flow in contained systems. Thus making it unwise to buy the first thing you come to and expect success. Aquadyne Plug & Play Filtration Systems take the hassle out of the decision making and installation process for you. Our primary goal in designing an Aquadyne Plug & Play system is Maximum performance, Maximum energy efficiency, Minimum maintenance, and ease of use. Every pond environment is different. Different water flow requirements, different plumbing layouts, different head pressures. Aquadyne Plug & Play components are designed to perform to the requirements of your ponds environment. Aquadyne helps you get your performance right the first time with no worries. After your equipment arrives and you have everything unpacked in the equipment area, your system can be up and running in less than an hour, provided that your suction and return lines for your pond are in place. we must first consider the basics. What is Your Budget: While Plug & Play Systems cost a little more than buying individual pieces of equipment up front, your savings is quickly recovered in the ease of installation and not having to worry about whether the equipment is installed correctly. The hard work has already been done for you. Aquadyne Plug & Play Systems are ideal for both residential and commercial installations. Our commercial installations already include applications such as zoos, aquariums, research facilities, fountains, and public water features. Aquadyne systems can be set in place and put into service within a short time of arrival and no prior experience with system assembly is necessary. Follow the simple installation instructions and the Plug & Play is up and running. Special Customized Options - To meet your specific performance needs. 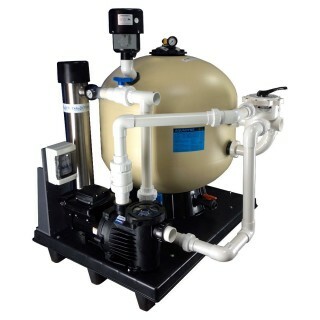 To purchase an Aquadyne Plug & Play System, Please contact us or check with your local distributor or internet dealer.